My next mission is to find some pleated high waisted menswear inspired pants. Some people are a bit iffy on them, but I have fallen in love with them. I'm not sure whether I will be able to wear them or not a) I'm not tall, I'm only 5'4 and b) I do not have an hour glass figure...so we'll see. I'll have to go scouring the thrift stores this weekend. Actually I doubt I'll have time to this weekend. I have two shows I'm selling Hattitude at coming up. On saturday I am at the macville School christmas craft show, I've heard it's really good. They have been advertising for it like crazy, plus it's in my home town. Then on Sunday I'm selling Hattitude in Toronto for a "Passion for Fashion" fundraiser for cancer and sick kids hospital. 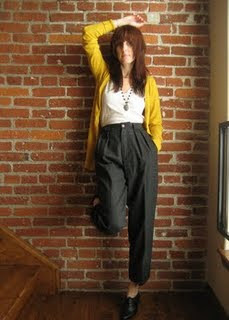 These are the pants I'll be looking for, posted from a really cute blog that you should check out Sally Jane Vintage by clicking here. This photo is from her blog. Check out the other photos from this sequence by clicking here.